Motivation is such a wonderful thing. It gives us energy to pursue our goals. Motivation can urge us onward toward of a myriad of accomplishments. It makes us excited to achieve and keeps us on track and purposeful in our actions. When one is motivated, there is less need for external prompting because there is an inward drive and desire that needs no supplementation. If only we could bottle it up and pull out motivation to dole out as needed! Homeschooling a motivated student is exciting and rewarding, providing a sense of the joy of teaching and affirming our efforts to help our children learn. If homeschooling is supposed to be a wonderful experience, why are so many of us lamenting the fact that our students not only do not eagerly pursue learning opportunities but appear downright unmotivated and reluctant to learn? If a motivated student reassures us that we are successful teachers, then the converse is also true. A reluctant, unmotivated student can cause us to question our ability to teach our children well. This doubt can lead our thoughts down other paths, where we wonder if we are up to the calling of homeschooling and if we will somehow be holding our children back if we continue. Before you go too far in questioning your ability to homeschool, please allow me to share some of my experiences as a homeschooling mother of a very reluctant, unmotivated student. He asked me that question no matter what the subject matter was, and in fact without even knowing which subject I was about to introduce. In response, I would plaster a smile on my face and try to exude exhilaration for the lesson. I tried to be funny. I worked at being more animated in my presentations. I used up a lot of energy, as if I were auditioning for the role of inspiring homeschool mom. Inwardly, I berated myself for my inability to stimulate a love of learning in my children. I have always loved learning new things, and I had carefully selected my curriculum. Night after night I strained my brain to come up with something I could do or change that would eliminate the reluctance my son felt toward schoolwork. I was beginning to despair. I had a heart to homeschool my children, but I questioned whether I had the energy and ability to do the job for the long haul. Then, one day, the circus came to town. Yes, I thought about running off to join it, but once again I didn’t seem to have the right skill set! I was already abysmal as a performer, judging by my child’s desire to get schoolwork over with as quickly and painlessly as possible despite my antics. So I took the children to see the circus, hoping that at last my son would be adequately engaged and intrigued by the novelty of the acts. My son watched the tigers with great interest. He was so intent while watching the trapeze artists that I’m not sure he even blinked during their entire act. Just as clowns appeared in one circus ring and horses began trotting around a second ring, my son turned to me and said something that changed me forever. Of course he had told me on many prior occasions that he was bored. All this time I thought it was my fault for being inadequate as his teacher. Hearing him say he was bored at the circus astonished me and gave me a valuable insight that helped me realize more than ever that homeschooling was the best option for my family. When my child informed me that he was bored at a three-ring circus, at first I was just plain shocked. Once the shock wore off, a sense of great relief came over me because I realized that even if I chose to wear feathers and swing from a trapeze while teaching, this child would become bored within about 15 minutes! The difficulty my son had with school was not because of any lack on my part as a homeschooler. Rather, it was the way he was wired that led him to be easily bored and inattentive. Once I realized that the attention and motivation challenges were essentially stemming from inside my son and were not due to my ineptness as his teacher, I was freed up to concentrate on ways to help him learn to motivate himself and deal with his frequent feelings of boredom. I began to focus less on critiquing myself and instead became more observant of my son. I noticed that there were certain times of the day when my son was more alert, and that it did not always coincide with my own states of alertness. I observed that when he was physically active for a short burst of time he was then able to attend to his lessons for longer periods. My son showed me that when he was emotionally upset or over-excited about something that we tended to have less productive days and my attempts to push him usually backfired. As my self-doubt regarding my ability to teach my child receded, I was able to direct that mental energy into finding out what my son truly needed. In addition to my great revelation at the circus, over time I became more and more convinced that homeschooling was ideal for a learner like my son. I could accommodate his needs and give him the attention he needed to stay on track and learn. Each year of homeschooling I was better equipped because of the previous year’s experiences. My son came to understand that even when I didn’t understand some of his challenges I would steadfastly believe he was capable of learning, and I would never give up. There will always be people with more impressive credentials, but we do not need to compete with them. As homeschooling parents, we are more invested in our children than anyone else. We have the motivation to help our kids, year after year, to teach them and show them love. Homeschooling can be challenging, but it can instruct the teacher as well as the students as situations arise. In my case, I always tell people that with all the learning and motivation challenges I faced, my children made me be a better teacher than I wanted to have to be. In the end, though, I am a better teacher and mom because of the things I learned while homeschooling my children. Joshua Fought the Battle of…the Flannelboard! Do you have a child who can always pay attention, sit still, and comply with directions and requests? If so, you may not be able to identify strongly with this post. On the other hand, you may have other children someday or know of some who are similar to my son, Joshua. My son has always been an “outside the box” kind of thinker. He is so far outside the box that he doesn’t know the box exists. He thinks in terms of what is possible, rather than being limited to pre-existing established patterns. To say that Josh is a non-conformist would be a gross understatement. This kid doesn’t just march to the beat of his own drum; he marches to the beat of his own oboe or something. His creative thinking made his behavior unpredictable at times, which in turn made parenting him very challenging. Can you relate? I am a pretty linear thinker, and although I’d like to think that my box is large I am definitely an “inside the box” kind of thinker. This was one of the challenges I faced in parenting Josh, because my own responses to situations were logical and predictable to anyone who knew me. Even though I tried I just could not anticipate how Josh would respond in many situations. Novel experiences were the most unpredictable, and I’m sure that even Josh did not know what he was going to say or do in advance much of the time. For example, our local library had weekly story times for preschoolers, and Josh looked forward to attending each program. Josh tended to observe rather than take part with most of the activities, though. He sat on my lap and watched the other children sing songs and do the motions to finger plays. When the librarian read books, Josh would push forward to get a better view of the pictures, but he usually sat on his knees so he wasn’t blocking others’ views. For Josh, the true highlight of each week was the flannel board story. The librarian would tell a familiar story, using the flannel board and various flannel pieces. Even though this was his favorite part of the 30 minute program, Josh could barely contain himself and wiggled and hopped around while the story was being told. With frequent reminders and prompts to sit down so that others could see, Josh waited for what he really liked best about the flannel board. Each story seemed to spark ideas for a hundred others in Josh’s imagination, and our librarian was kind enough to give Josh free reign with the flannel board following the official story time. With or without participation by others, Josh would tell his original stories or take the existing story and give it multiple alternative plots and conclusions. Inevitably, Josh’s stories would include a battle of some sort. He could take the most peaceful setting and turn it into an epic battlefield. Since Josh like flannel board stories so much, I bought him a huge set of Bible flannel board pieces. I thought it would be a great way for Josh to learn some Bible stories. He loved it! As my oldest child, I thought he might like to teach some of these stories to his younger sisters and it would be good practice for his oral language skills, too. Josh dutifully repeated the story I taught him, and then devoted his energy to expressing his creativity and imagination. Another flannel board battle ensued each time the carefully organized Bible set was brought out for a new story. I am a Mom who likes things to be in their proper place, and the flannel board set had outlines of the pieces on each storage board which greatly appealed to my desire to have things organized. Josh, however, liked to select pieces for his stories willy-nilly and (gasp) even took pieces from different boards and stories that were not grouped to together. He even mixed up the Old and New Testament pieces. It was horrible! Okay, it is probably not that big a deal to most people, but it was a battle for me to give up my neatly arranged flannel board pieces so that Josh could express his God-given creativity. Josh is now a young adult, but he still remembers the flannel board stories with great fondness. He remembers making up many adventurous tales and having a lot of flannel pieces to work with from our large Bible flannel set. His favorite, he recalls, was the time he put the kneeling Jesus figure behind a large clay jar on a table turned on its side to provide cover. 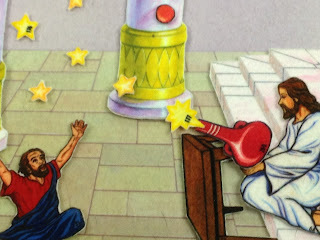 From that position, Jesus proceeded to shoot stars at his disciples across the room. And so it went in the imagination of a young boy, who believed that Jesus could do anything including spraying stars wherever He wanted them to go. Whereas some people lament their lack of creativity, Josh and other outside the box type of thinkers find they have to stifle their creative urges many times throughout the day. It was always a challenge for me to find good boundaries that allowed Josh to follow his many ideas that led him in a myriad of directions while redirecting him to get his school work completed. Getting the academic work done did take us longer on some days when Josh pursued some of his imaginative ideas, but I wouldn’t squelch the creativity of my son for anything. Have you ever been baffled or surprised by something your child says? You may be certain that you heard the words correctly, but they don’t make sense. Having children with learning struggles, I often found that I needed to clarify both what I said to my children and what they were communicating to me. With a combination of ADHD (attention deficit hyperactivity disorder) and auditory processing difficulties, communication was often a challenge. First, I had to obtain and keep my child’s attention long enough to convey a message. Then I had to determine if the message had been accurately received. If distractibility and impulsivity didn’t interfere, we could have a good conversation. Children with learning disabilities often have unusual ways of expressing themselves. My son Josh had some word finding difficulties, so he would refer to the ankle as “that wrist part of your leg”. Likewise, the elbow might be “the knee of your arm.” Once when Josh wasn’t feeling well I asked him to describe his symptoms. He often used vague and nebulous words to tell me what he felt. I felt like a detective who needed to ask just the right questions to get my suspect to tell me what I needed to know. One time, though, Josh told me his throat was sore and described what he was feeling in this way, “I feel as if my uvula has been acided off”. (I like the “uvula” part – true son of a speech therapist!) This description, although no doubt atypical for most children, painted a clear picture of the location and degree of Josh’s discomfort and indeed it turned out that Josh had strep throat. “Acided” may not be a real word, but it sure got the point across. Josh usually sailed through illnesses with little response to pain, so when he complained I knew it was serious. When children are infants, we fret because they are not able to tell us what is wrong or where they hurt. We think how nice it will be when they are able to talk and tell us more exactly what they feel. If a child is a late talker, nonverbal, or has difficulty with expressive language we have to continue interpreting possible meanings to whatever communication attempts our child is able to produce. My daughter Beckie was a big talker, and it was easy to tell that when she wanted “lunch fries” she meant “french fries” and that her “Valentime” was a “Valentine”. Since she had auditory processing issues, she said things the way she heard them and I continued in my role as communication detective to determine what Beckie was trying to convey. This was somewhat complicated by the fact that Beckie chattered a lot and was not always looking for a response but rather was processing her experiences by speaking out loud. When she was a preschooler I noticed a frequently occurring phrase, “I need eleven!” Eleven what? I tried to figure out if she was trying to practice her counting skills, trying to collect something, or was just repeating something she had heard. But where had she heard it? Beckie was always a cuddle bunny, and was frequently snuggled up in my lap while we read books or talked. I tried to become aware of the context when she “needed eleven”, but couldn’t narrow it down. She said it contentedly when she was climbing onto my lap or getting a hug. She said it when she was physically hurt and when her feelings were hurt. When I asked her if she wanted to count to eleven together, she happily replied in the negative and wrapped her arms around me for a tight squeeze. One day Beckie had been visiting one of her best friends for a play date, and I went to pick her up. She and her friend were sad to have to part ways, and the other child’s mother offered comfort by asking her son if he needed a lovin. I realized that “Do you need a lovin?” was a common phrase in that household, and in Beckie’s young mind had been translated into “Do you need eleven?” It had nothing to do with numbers, but had a strong connotation to comfort and the expression of affection. Since I had responded in ways she needed despite my lack of understanding about what she was saying, Beckie was inadvertently effective in her communication with me. This is just one more reminder that love can make up for so many things. We all make mistakes with our children. We realize after the fact that we erred in our approach to teaching some students. We feel the pressures to convey the right amount of information at the right times while helping our struggling students develop skills to help them be successful. Our curriculum isn’t always a match for what we need. Our children may not be progressing at the rate we desire. We lose it. We yell, we apologize, and then catch ourselves being impatient again. We feel inadequate to meet all the needs we face on a daily basis. The stakes are so high. You’ve heard it before but it bears repeating. What our children will remember the most is the relationship we have with them, not the specific things we deliberately taught or the strategies we used to help them learn. I blew it with my kids sometimes, and I knew it. I truly believe that my relationship with them is more important than any school subject and thus needed remediation before we could proceed with our official homeschooling. I find it very humbling, yet restorative, to apologize to my children when I have wronged them. They have always been very forgiving and amazingly resilient, a picture of God’s grace to me. Showing grace and respect runs both ways in a relationship. It builds character and will outlast the school years as a child grows into an adult. Have you been focusing so much on getting the school work done that you’ve lost sight of the importance of relationship? Don’t let standards and benchmarks keep you from seeing the individual child who is right in front of you. Teaching a child is a great aspiration, and teaching in the context of a relationship is powerful. Children may not remember everything you’ve taught them, but they will remember you. Do you have the kind of relationship you want to become part of their lifelong memories? Let’s give our children lots of “elevens” and protect our relationships as they grow. Ahhh, executive functions. We love them, and when they are lacking we long for them. 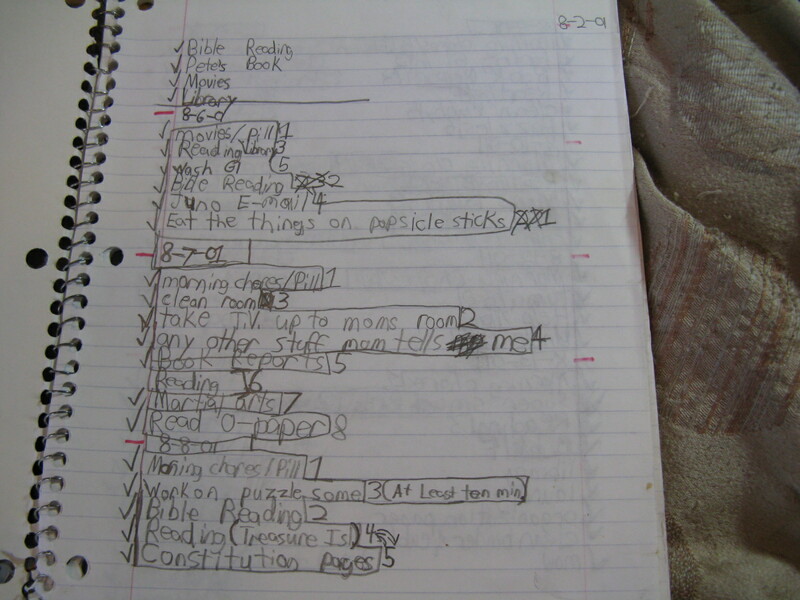 Children with AD/HD struggle to develop vital executive functions such as organization and planning. Students with learning disabilities and struggling learners (officially identified or not) often have some degree of executive dysfunction. Any experienced teacher can look at a student’s notebook and tell if that student is able to organize and access the information and materials they will need. Intelligence plays a part in academic success, sure, but the organized student typically comes out on top. Executive functions help students to show what they know. If they have completed an assignment but can’t locate it the teacher has no way to assess their performance. A very bright student who forgets about an assignment or fails to complete the work even though he has the capacity to do so will be out-performed by an average student with the executive functioning skills to complete tasks accurately and on time. Children with learning challenges work harder and longer to get results and deficits in executive functioning impact all areas of life, not just the academic realm. Consider, for example, the child who forgets he made plans with one friend and is off with another when the first friend comes calling. Or the child who struggles with time management and is chronically disorganized causing her to be late for practice again because she can’t find her mouthguard. Some children just naturally seem to develop executive functions as they mature. Others need much more direct instruction than our modeling alone provides. In the picture above, you can see the rudiments of Josh’s attempt to develop some executive function skills. 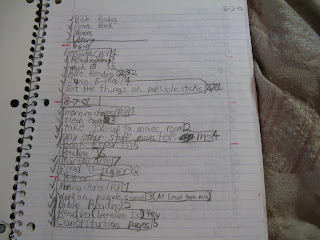 He has written out the date and the tasks he needs to accomplish each day. He put a check mark next to completed work. Josh’s system is far from sophisticated, but it reflects his burgeoning attempts to incorporate some organization into his day. Is Josh’s method acceptable? It wouldn’t be what I would choose, but Josh is a unique individual. I had shown Josh various organizers and examples that I would use but he had to find something that worked for him. The picture shows what he came up with, and although there are many things I would do differently the idea was for Josh to find a system that worked for him. In the last six weeks, I’ve had the opportunity to speak at three different state homeschool conventions. At each conference I attend, I share information about learning disabilities, Attention Deficit Hyperactivity Disorder, Sensory Processing Disorders, and Auditory Processing Disorders. More important than the facts I pass along are the real-life stories from my own family experiences. I share what didn’t work as well as what worked at least some of the time. I share some of the failures and frustrations as well as our hard-won achievements. When my first two children graduated from our homeschool in 2006, we declared our school colors to be black and blue. We were the homeschool of hard knocks! Not only did my children struggle with learning, but I struggled to try to find better ways to teach them. One of the biggest benefits for those attending workshops for children with various special needs is to look around and realize they are not alone. There are others striving to teach children with challenges, and others who understand the difficulties families face when their child has to work harder than most for every small gain they accomplish. What has always amazed me is how God has prompted me to share some of the hardest, most unimpressive movements of my life and that is what people are blessed by in my workshops. Sure, I offer lots of tips and practical strategies, but what people connect with is hearing a speaker who admits to not having it all together but never gave up trying. My son is a young adult now, and he comes to conferences with me. People look at the two of us as survivors, who dealt with a lot of learning challenges and came out intact. Now Josh can share his perspective, and give parents insight into why their children may act the way they do. I’ve never had all the answers to the challenges my children faced. What I did have was a commitment to help them grow into the unique individuals God intended them to become, equipping them as best I could. Sometimes I was out of ideas for how to teach a given topic, and my kids still weren’t “getting it”. All I had to offer was reassurance that I would keep trying to find ways to help, and would not give up on them. I would be the knot at the end of the rope that they could hang onto. The message was: Mom doesn’t have all the answers but Mom will always be there with you, coming alongside until we figure something out. Don’t underestimate the power of just being there for your children. You don’t need to know all the answers, but your kids need to know you haven’t given up on them. It’s in the safety of knowing your love is unwavering that your children find the courage to try again, fail or succeed, and try some more. Our children are far more than what they can or cannot do, and they each have something to offer. This overall supportive attitude has a far greater impact than the best teaching strategies in the world. I love talking with my son, Josh. He has such interesting perspectives and the way he verbally expresses himself gives me insight into how he thinks and processes information. When he was young, Josh had some difficulty remembering words so he would use descriptions to get his point across. He once described his ankle as “you know, that part that’s like the wrist of your leg”. He tended to use vague words such as “thing” and “that” rather than specific word labels. Despite the circumlocutions, I could always tell what Josh was talking about. Since Josh struggled to recognize many nonverbal signals and had to be taught how to use appropriate body language when he interacted, I could never take it for granted that Josh would just pick up on social cues and be able to express himself adequately. He could learn how to interact with other people, but he had to be taught specific discrete skills for social interactions. For my daughters, social skills came naturally and they just seemed to intuitively know how to relate to others. For Josh, it was like being in a foreign land where everyone else seemed to know the language but he struggled to learn basic communication and was vulnerable to being frequently misunderstood. I did speech therapy with Josh to work on conversational turn-taking, topic maintenance, and nonverbal ways to let a listener know he was interested. Unfortunately, Josh often was not interested in what others wanted to talk about, so then I had to teach him about being polite and a good friend by sometimes letting someone else take the conversational lead. Once Josh had some of the basic skills for social interaction and was able to express himself more effectively, he continued to practice and fine tune his communication exchanges. I noticed that Josh often did not respond when given a compliment. Outside of the family, Josh didn’t get many positive comments so he didn’t really know how to respond when it happened. I talked to Josh about possible responses and we role-played several situations together. After our practice session I reminded Josh that he had lots of strengths worthy of compliments so it was good that he was learning how to respond to them. Josh informed me that “Vanity was never my strongest weakness.” Say what? After some probing (they don’t call me the Momster for nothing) I was able to help Josh expand his message so that I could understand what he meant. His intention was to indicate that although he was aware that he had many significant challenges, being vain was not one of them. Therefore, he needed some help in learning how to respond to compliments. Even today, Josh comes up with some unique responses that catch me by surprise. Just this morning our dogs were playing and one of them ran over and stood next to me. I said, “Look, Josh, she’s on base.” After a brief pause, Josh jokingly said, “Then I’ll be lead guitar.” Say what? Translation: “base” sounds like “bass” as in a type of guitar. What’s a band without both bass and lead guitars? Josh was making a play on words, and at least now he understands what I say and makes a deliberate choice to joke and say funny things. Need some fresh ideas to use with your students? Don’t throw those wrapping paper scraps away, and hold on to that used gift wrap for a little while longer. Here are some ideas for using wrapping paper as a teaching tool, and it won’t hurt your budget a bit. 1. Use leftover pieces of gift wrap to practice scissor skills. Include some narrow strips of paper so that beginners can feel the success of cutting through the strip. Snip, snip! 2. Cut out images from the wrapping paper to play a matching game. Want something that will last? Glue one set of pictures on the inside of a file folder, and glue the matching pictures onto index cards or card stock paper. A little packing tape will work about as well as lamination to keep the pictures preserved for multiple uses. 3. Work on handwriting skills by having your child circle images on the gift wrap. If that’s a bit too challenging for your student, help them just draw lines connecting the pictures on the wrapping paper. Washable markers may show up better than pencil, especially if the paper has an intricate design. 4. Use both hands together as you tear wrapping paper into pieces. Glue the pieces onto the back (blank) side of another piece of gift wrap. For a greater challenge, try shaping the pieces into seasonal shapes such as a snowman or Christmas tree. 5. Develop hand strength by balling up the paper and squeezing it. 6. Practice following directions and visual discrimination by pointing to named pictures on the wrapping paper. 7. Work on listening skills by covering your eyes and trying to identify the location of a crinkling paper. 8. Teach about recycling by crumpling up old wrapping paper to use for packing material when preparing packages to be mailed. For added fun try throwing the wadded up paper into the box from various locations near the “target”. 9. Work on expressive language skills by naming or describing pictures on the paper. 10. Provide sensory input by putting scotch tape on paper. Try to offer a variety of thin, heavy, slippery and shiny paper to experience the different qualities of each. Don’t you just love inexpensive materials that you can make yourself? I sure do, and I feel so frugal and creative when the activities are also fun for my kids. Greek Mythology – or is it “miss-ology”? A few years ago I did a unit on mythology as part of our homeschool curriculum. We learned about Greek mythology as well as mythology that originated in various other parts of the world. Although I found some of the stories to be kind of creepy at times, there’s no question that it held the interest of my children. Still, when you have struggling learners even interesting materials tend to be remembered more in general terms than with specific details. My daughter, Beckie, who has AD/HD also has working memory challenges. Allowing her to draw some of the mythological characters helped her to keep them all straight in her mind. She’s very creative and artistic, so drawing appealed to her and was a good challenge as she attempted to sketch some very unique creatures. Children with learning differences often struggle to generalize information they have learned. Admittedly, there’s not a high need for generalizing information gleaned from Greek mythology so I didn’t worry about it too much. I just wanted my children to have a basic understanding and a frame of reference when mythological characters were mentioned in literature and other media. I also taught my children about foreshadowing in literature, so one day when I was reading aloud to Beckie from a non-mythology book I paused and asked her a question about what was read. She made a good prediction about what might happen later on in the story, and I asked her how she figured that out in hopes that she would respond that she recognized the foreshadowing that had just occurred. Instead, Beckie proudly announced, “I’m Cyclops!” I was baffled for a minute, and sat there in stunned silence trying to figure out where that answer came from. Since she does not have one eye in the middle of her forehead and is actually quite lovely, to describe her as “Cyclops” clearly didn’t fit. I could not recall that Cyclops were known for recognizing foreshadowing, either. As I rolled possibilities around in my head, an idea struck me and I asked Beckie, “Do you maybe mean ‘psychic’?” and she laughed and said that was it. She couldn’t recall the term “foreshadowing”, so pulled up a word that sort of fit. I love my Beckie for not being afraid to give things her best shot. She’s confident and can laugh at herself, even as she boldly attempts to answer questions that she does not have a precise answer for. Let’s hear it for all the children like Beckie who try and try again, and who don’t let mistakes prevent them from offering their answers and making contributions. The “right brain” learners tend to see the big picture and don’t focus on all the details. These are the students who take a more gestalt approach to learning. With my right brain learners, I’ve found that they are satisfied if they just get the gist, and “close enough” is good enough for them. I may have been a bit too successful in not passing along my own perfectionist tendencies! I am also a “left brain” learner, preferring to do things in a logical sequence with attention to detail. This video is a reenactment of part of a geography lesson I did with my daughter, Beckie, who is definitely presenting as a right brain learner. I hope you enjoy this clip of “right” meets “left” during our homeschooling moments. For more ideas about working with your “right brain” and “left brain” learners, see my workshop “Adapting Curriculum for Learning Differences“. I was recently contacted by a mom who had a speech therapy question for me. Her teenage son had a lisp and although they had tried a few different things to correct it in the past nothing seemed to work. Her question for me was to ask if her son might be able to correct his speech or if it was too late. While it is true that children should be able to produce all speech sounds correctly by the age of 8 years, the good news is that speech articulation can be improved at any age given that the necessary physical structures and functions are adequate. It takes practice, motivation, and cooperation. When you can correct speech at a young age, it is often easier because the incorrect patterns are not as established as when a child has been pronouncing sounds incorrectly for years. An older child, teenager, or adult has a harder habit to break in addition to learning a new way to say speech sounds. When there are multiple sounds in error, a speech/language pathologist can help determine which errors are developmentally acceptable and which are beyond the expected age for the sound to develop. Working on developmentally earlier sounds increases the likelihood of success and lessens frustration. The teenager whose mom had contacted me had been asked to do a reading at a wedding and as a result was very motivated to improve his speech prior to his public speaking engagement. This motivation, along with strong parental support, was the strongest prognostic factor for improved speech sound production for this young man. Although he could have corrected his speech earlier, without the motivation to work on it and practice he didn’t experience much change in his speech and it didn’t bother him since his speech was understandable despite the lisp. But now he had a goal and was motivated to make the necessary changes to bring his speech up to par. It just so happened that this family lived only a few miles from me, so I agreed to work with them for a few weeks to see if I could help the boy meet his goal of speaking clearly. Being a busy teenager, his time for practicing his speech had to fit in with all his other activities. With that in mind, we discussed practicing for 5-10 minutes each day rather than an occasional longer session. This was not only reasonable for his schedule, but the short yet frequent practice sessions helped him be more aware of his speech and generalize his new skill. After seeing this motivated teenager for just four speech therapy sessions, he is able to speak and read aloud without lisping. He is practicing good speech sound productions on his own and the result is carrying over into his everyday conversations now. He is ready to do his public reading and is a good example of what motivation and practice can accomplish. His speech articulation will never hold him back now that he knows what to do and is willing to work to make it happen. I am thrilled for him and his family and I’m very proud of what he has accomplished in a short period of time.